This is the perfect excuse to get some night photography practise. So clean the lens , check the tripod and swat up on night exposures. Find a location with clear vision of the Eastern horizon, download Moon Phases App for your phone or the SunCalc.net App to get the exact location in the sky of the rising moon. Last blue moon I missed the moon rise while photographing the sunset...with my back to the moon so did not see the moon until it had been risen for 10 minutes. On January 31, Australia and the Pacific will have front row seats to the rare astronomical event. FOR THE FIRST time in over 150 years, three lunar phenomena will collide – producing a Super Blue Blood Moon on January 31. Not only will it be the second full moon in January, but the moon will also be close to its nearest point to Earth on its orbit, and be totally eclipsed by the Earth’s shadow. 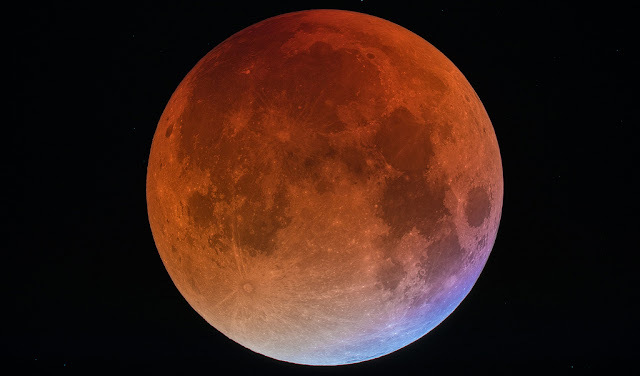 While the three aren’t particularly rare – the last Super Moon was on January 2 this year, and the last Blood and Blue Moons were in 2015 – the chances of them all occurring at the same time are quite slim. The result will be a spectacular display – a very large, red full moon – which hasn’t occurred since March 1866. Australian Astronomical Observatory astronomer Fred Watson says a Super Moon is defined by a full moon occurring at the nearest point to the Earth on the moon’s orbit. Due to this proximity, Super Moons appear seven per cent larger and 16 per cent brighter than the average full moon. Fred says the term ‘Blue’ Moon originated in folklore, and is defined as the second full moon in a calendar month – with the first on January 2, and the next on Jan 31 at 9:26pm WA time. In Western Australia, this will actually be followed by a Black Moon, which is the lack of a full moon in a calendar month – with no full moons until March 2. Due to the time difference, the second full moon will fall just after midnight in NSW and Victoria (12:26am) bringing it onto February 1 – therefore not technically a blue moon for Sydneysiders and Victorians – but it will still be a spectacular sight. A Blood Moon is the modern term for a total lunar eclipse – when the moon is completely blocked by the Earth from sunlight. Unlike a solar eclipse, a lunar eclipse is safe – and beautiful – to observe, and Fred encourages people to head outside and have a look. “Once it gets into the deep red shadow, you get the best view once you get out of the city – and binoculars make it really special,” he says.